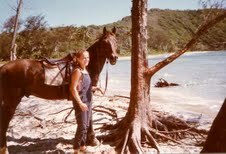 One of the most remarkable experiences of my life took place on Cape Tribulation in the far north of Australia. It was summer time and very, very, hot and very, very, humid. My sister and I were staying at a hostel in the tropical rain forest, next to a mangrove swamp and the sea. There was a generator for power which was switched off at ten o’clock at night. After that unless you had candles or a torch, which we didn’t, the night was completely black and dark but far from silent, as the rain forest outside (and inside) the huts, was teaming with life. We were staying for a few days and my sister had noticed that there was a riding stable next to the beach. That sister, like all my sisters, is a a very keen and very good horse rider, so we decided to see if we could go riding. She arranged for us to arrive early to help get the horses ready with bridles and saddles. Although I do know how to ride I hardly knew what to do to prepare the horses; my sister was expert. She has a special affinity with and love for horses and is truly happy around them. There were about five or six of us going for a ride that day and the setting was beautiful. The tropical environment may be beautiful but it is harsh and we had been told that at that time of year you could not swim in the sea because of the blooms of deadly box jelly fish. We set off along the shore line at a gentle walking pace, in the shade of the trees, but towards the end of the ride the horses broke into a gallop. I was a little bit fritghtened but I hung on tight, my sister flying along in front of me. It was thrilling and exhilerating. Galloping along that tropical beach would have been enough of an experience to last me my whole life, but when the ride was over the leader said to us. Would you like to take the horses for a swim? At first I was worried about the deadly jelly fish, but the leader said that as we were wearing our jeans our legs were covered so it would be alright. She asked us to take the saddles off the horses as the salty sea water would be bad for them. We left the reins and bridles on. So now we were riding bare back which I had hardly ever done before and I began to feel more at one with the horse. Following our leader, we steered the horses towards the water. They were hot and sweating after the gallop and the water must have seemed inviting to them. They stepped delicately into the waves. This part of the coast was within the great barrier reef, so there was very little breaking surf and the water was calm. The water quickly covered our feet and legs and was soon up to our waists. Then I realised my horse’s feet were no long on the ground and she was swimming straight out to sea. We were laughing and excited but then above the sounds of human voices I started to hear another sound. It was a strange, moaning, groaning sound. It was coming from the horses. They were stretching their heads up out of the water and the noises they were making were completely unlike any sound I had ever heard a horse make before. It was not any kind of snorting or, neighing or winnying, rather it was a kind of ectstatic bellowing. It seemed that the horses were relieved to be in the cool water. I still don’t really know if that is what it was. The leader of the group said that they always did that in the sea. Many years later I asked a vet who mainly treated race horses if he had ever heard of such a thing, and he said that yes under those kind of circumstances horses do make that kind of noise, but he was a bit vague. At the time I felt a kind of wonder, mixed with just a touch of fear. At one point the horses were heading out to sea and I wasn’t sure how I was going to get mine to turn round. But she did of course, following the others and soon I could feel the solid ground under her feet. As we emerged from the water, the horses stopped groaning. We rode them back up the beach, put the saddles on and took them back to the stables. In all we had probably been out for an hour or so, but it is an experience that will stay with me forever.